Xi Jinping, general secretary of the Communist Party of China (CPC) Central Committee, has stressed the revitalization of China's northeast region with fresh efforts. Xi, also Chinese president and chairman of the Central Military Commission, made the remarks during a research trip from Tuesday to Friday to the provinces of Heilongjiang, Jilin and Liaoning. To revitalize the region, China should implement a series of policies made by the CPC Central Committee, stick to the new development philosophy, forge ahead with determination and an open mind, maintain targeted and continued efforts, deepen reform to tackle contradictions and make good use of advantages while avoiding shortcomings, Xi said at a symposium during the trip. Han Zheng, a member of the Standing Committee of the Political Bureau of the CPC Central Committee and Chinese vice premier, attended the symposium. On Tuesday, Xi inspected Jiansanjiang, an important grain production base in Heilongjiang Province. At a local agricultural machinery center, Xi listened to briefings on modern agriculture development, grain production and water resource utilization. 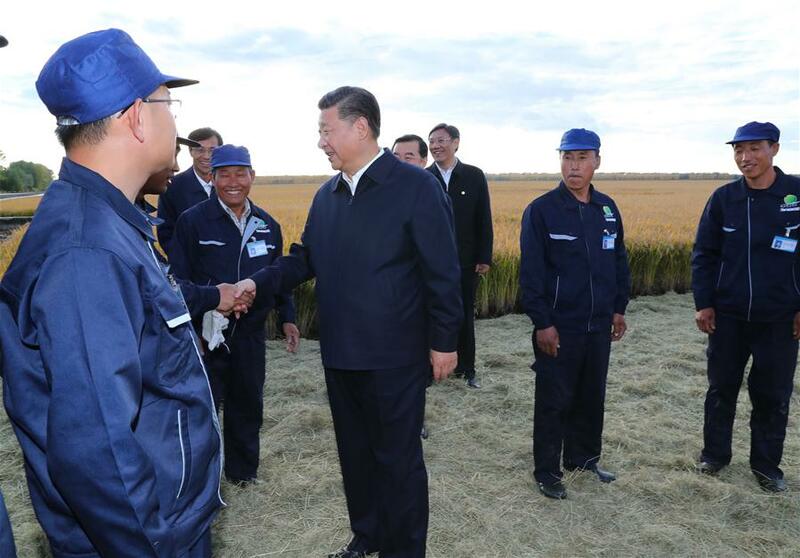 In the rice field, Xi talked with farmers on grain production and asked about their livelihoods. Xi stressed that agricultural reclamation has made significant contributions to ensuring national food security and supporting national development while maintaining stability at the borders. He called for implementing the new development philosophy and accelerating the development of large modern agricultural bases, companies and industries. "It is necessary to speed up the development of green agriculture and work to avoid the loss and degradation of black soil," Xi said. "China should always have control over its own food supply." At an agricultural science park at Jiansanjiang, Xi was briefed on the research and application of agricultural technology. China's modernization cannot be achieved without agricultural modernization, the key to which is science and technology and talent, Xi said, adding that more prominence should be attached to the development of agricultural technology and vigorous efforts should be made to advance mechanized agriculture and smart farming. On Wednesday morning, Xi inspected two large state-owned equipment manufacturers in Qiqihar, an old industrial base in Heilongjiang Province. During a visit to CRRC Qiqihar Rolling Stock Co. Ltd., a freight train producer, Xi heard reports on its production and sales and watched fatigue and vibration tests of freight trains. The president recognized the company's achievements and encouraged it to achieve new successes by further exploring global markets and better serving the Belt and Road Initiative. Equipment manufacturing is a pillar of the nation, as well as a significant component of the real economy, Xi said, asking the company to make greater efforts to step up indigenous innovation and develop new technologies and products. Xi also went to the workshops of China First Heavy Industries Co. Ltd. and learned about its world-class, self-developed 15,000-tonne hydraulic press. High quality development of the manufacturing sector, in particular that of equipment manufacturing, plays a major role in China's drive toward high-quality development of economy and is indispensable for a modernized nation, Xi said. China must stick with the path of self-reliance amid rising unilateralism and protectionism in the present world, Xi said. On Wednesday afternoon, Xi inspected the ecological protection of Chagan Lake, one of the largest freshwater lakes in the country. The sound environment is a precious resource for the economic and social development of the northeastern region, serving as an advantage for its revitalization, Xi said, asking local authorities to give priority to environmental protection and remain steadfast in green development. In the city of Liaoyang, Xi visited a local branch of state-owned oil giant PetroChina Thursday, stressing that state-owned enterprises (SOEs) hold an important position and play a key and irreplaceable role as a significant strength for the Party and the nation to count on. SOEs should also make reforms and innovation and constantly improve and develop themselves, Xi noted. He urged consistency in upholding the Party leadership over SOEs and in advancing SOE reforms in order to achieve development of higher quality and better efficiency with improved structure. Also in Liaoyang, Xi visited a private industrial enterprise, where he stressed that China adopts a basic economic system in which public ownership is the mainstay of the economy and economic entities of diverse ownership develop together. "Private enterprises should strengthen their confidence," he said, noting that the CPC Central Committee has always supported and encouraged the development of the private economy and has rolled out a slew of reforms to help the sector develop since the 18th CPC National Congress. Xi urged efforts to create a sound legal and business environment for private enterprises, protect their rights and interests in accordance with the law and work to encourage, support, and guide the development of the non-public sector. On Friday, Xi visited a memorial hall for Lei Feng, a soldier well-known in China for his generosity and altruistic deeds, in the city of Fushun, Liaoning, where Lei served in the army. Calling Lei "a model of the time" and the Lei Feng spirit "ever-lasting," Xi said more models of the time are needed to achieve national rejuvenation. "We should learn from Lei's spirit and practices to turn lofty ideals, convictions and moral qualities into concrete actions in ordinary life and work, and make our due contributions so as to carry on the Lei Feng spirit for generations," he said. While inspecting a coal mine in Fushun, Xi said well-conceived assessments should be made to comprehensively improve the conditions of areas affected by coal mining-induced subsidence. He then visited a community relocated from the subsidence-affected area and chatted with residents, noting that he is very much concerned about the transition and development of resource-exhausted cities. Xi said it is necessary and worthwhile for the CPC Central Committee to make significant investments into rebuilding shanty towns and improving the conditions of subsidence-affected areas. Solving problems concerning people's livelihood and helping those living in difficulties should be given priority in the transition and development of resource-exhausted cities, Xi said. On Friday afternoon, Xi convened and presided over a symposium on advancing revitalization of northeast China, in the city of Shenyang, Liaoning Province. He delivered a speech at the symposium on the issue, where he gave six-point instructions on making further progress of the cause. First, efforts should be made to comprehensively deepen reform on the basis of improving the business environment. Reforms should be refined with solid steps taken in facilitating the deepening of supply-side structural reform, fostering new growth drivers, energizing market entities and strengthening the people's sense of fulfillment, as well as mobilizing and protecting the enthusiasm of officials and the people. Xi called for comprehensive measures to make certain that the region can retain talent. Second, priority should be given to fostering new growth drivers and stimulating the internal forces powering economic growth. Xi urged efforts to solidify and strengthen the real economy by relying on innovation, comparing the efforts in supporting faster development of emerging industries to "vacating the cage and changing the bird" and the "nirvana of the phoenix." Third, Xi stressed efforts in developing modern metropolis circles and enhancing the cooperation in key regions and areas to forge greater synergy of the region's opening-up. Xi highlighted integrating the northeast region's development with the country's major development strategies, including the coordinated development of the Beijing-Tianjin-Hebei Region and development of the Yangtze Economic Belt. Fourth, Xi called for efforts to better support ecological construction and food production to build on the strength of green development. Lucid waters and lush mountains are invaluable assets and so are ice and snow, Xi said, calling for making the local environment even better and giving a full play to the region's special resources and strength in developing winter economy. Fifth, Xi stressed the need of deeply integrating the region with the construction of the Belt and Road Initiative toward new heights in opening up. Major tasks concerning the pilot free trade zone in Liaoning Province should be implemented in a faster manner, while infrastructure of major border ports should be improved and clusters of competitive industries should be developed, Xi said. Sixth, Xi called for greater efforts in shoring up points of weakness related to public well-being to let the gains of the revitalization benefit the people. Upholding and strengthening overall Party leadership are strong guarantees of the region's revitalization, Xi said. Xi also called for strengthening Party building in the region, improving the Party's political ecosystem and showing zero tolerance for corruption.